Why would anyone put the toilet roll going any other way than the one you show?!? It baffles me that people DON'T always put it that way! The clean tea towels must go to the bottom of the pile in the cupboard and be used in rotation. I have been known to walk back to my house to check the door is locked when I'm almost at the train station. When I smoked I would pick up each stub from the ashtray and make sure it was cold and then put the ashtray in the sink before going to sleep at night. Hope your journey is stress free and that you get to spend some good time with your Mother. Sending many hugs. I'm very obsessive about the toilet paper thing! The other thing is placing the empty roll in the rubbish, I have to do it, and it pisses me off to no end if it's not done. 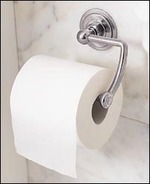 I get really upset when the loo paper is upside down in those lockup holders in public loos, and I can't make it right! Yes you are not alone!!! Oh I SO relate to your bridge anxeity. It doesn't even have to be a long bridge if I end up getting STUCK on it during a traffic jam. I felt the same sort of relation to Hughes when I saw that movie too!! Definitely with the germ-phobia and the touching thing - and I've definitely had my isolation phases too - sans the bottles of pee. I always try to open public restroom doors with a piece of tissue or my pinkie finger...and if bare feet - someone else's or even my own - get anywhere near any part of my body...I have to wash.
Makes you wonder if we all have a little ocd in us, huh?